A fully-grown larva is 10 mm long. Head capsule is pale to pale greenish or pale brown, mottled with brownish and black-brown spots. Eye spot is black. Body is green, sometimes tinged with pale yellow with distinct body segments, and bears a few short hairs, marked by the presence of small white patches. The larva has five pairs of prolegs; a pair of prolegs protrudes from the posterior end forming a distinctive 'V' shape. The adult is grayish brown with a 9-mm-long body and a wingspan of about 12-15 mm. In males, upper two-thirds of forewings is light fuscous, sometimes partially ochre-tinged; sometimes mixed with whitish scales, and flecked with scanty small blackish dots. Lower one-third of the forewings is ochreous-white, the upper edge being nearly white, margined broadly with dark brown or black-brown. In females, the upper two-thirds of forewing is light ochreous or light grey-ochreous, the contrast not so pronounced between upper and lower portions in coloration, but the markings are like those of males. When wings are folded, three or four diamond-shaped areas formed by forewings are visible on the dorsal side when moth is at rest; hence the common name 'diamondback moth' gives details of wing venation and genitalia. The moths are weak fliers and can disperse, on average, only 13-35 m within a crop field. They are readily carried by the wind and can travel long distances, at 400-500 km per night. The rate of development of larvae is temperature dependent. There are 4 larval stages (instars). Caterpillars are active, slender, green worms with microscopic hairs. The larval period varies from 6 to 30 days. On young cabbage and on watercress, early larval instars migrate to the growing point and cause extensive feeding injury. 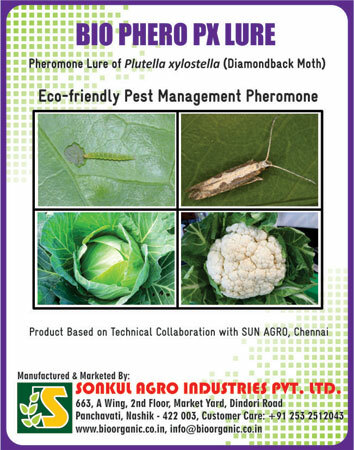 The damage caused by the larvae feeding is often very severe and in most areas good quality cabbages cannot be grown unless the insect is controlled. Adults are small, grayish moths, approximately 1/3 inch in length. When the wings are folded, the moths have a line of three diamond-shaped markings that occur along the middle of the back. Males and females are the same size. Females live from 7 to 47 days and males live from 3 to 58 days. The number of eggs laid per female may range from 18 to 356. Oviposition normally begins on the day of emergence lasting about 10 days. The number of eggs produced by a single female is influenced by photoperiod, temperature, and age or condition of larval food.